Hover over your name in the top right hand corner of the dashboard. On the drop down menu, click on 'Account Settings'. Confirm the changes by clicking 'Update Notification Settings' at the bottom of the card. What are the notification types? 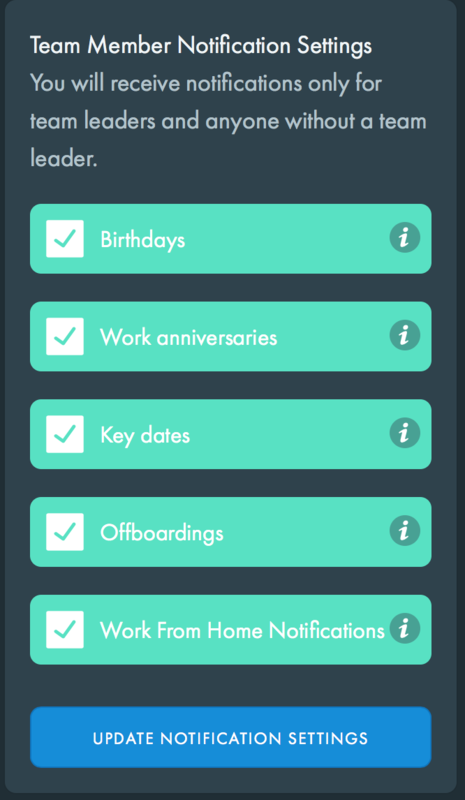 A weekly overview (every Monday morning) of everything that’s happening within your company/team, including holidays, birthdays and key date reminders. Details any payroll changes that have been made that week. Notifies you of a team member’s birthday both seven days and the day before. Notifies you of a team member’s work anniversary both seven days and the day before. Notifies you of a Key Date both seven days and the day before. Notifies you when a team member has been archived.